And then there was the Mini. 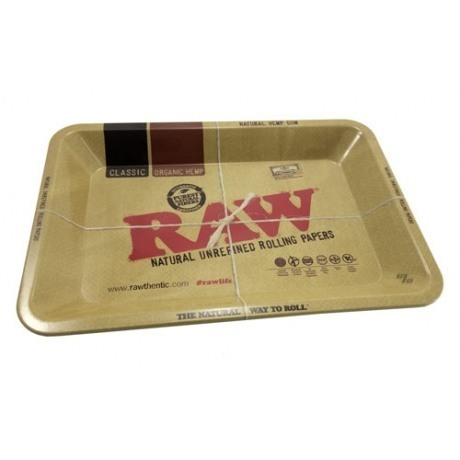 Super cool personal size rolling tray; brought to you by RAW Rolling Papers of course. Mini metal tray with curved edges to hold your tobacco and accessories while you roll a smoke up. Personal Sized at 7 x 5 inches. RAW rolling trays have become an instant classic. This is a very cool metallic tray. It’s perfect for “leaf only” rolling. It is a little magnetic, too. Perfect little tray. Works great. This one's my favorite for EDU. I also have the small tray ( a bit larger) for grinding etc. Both come in very handy along with some very small parts trays I had from modelling. Good quality tray! Very convenient size! Thanks 1percent! This little guy is perfect for a quick trip to the bathroom. Lightweight and helps ya get the job done. A well made well priced rolling tray. Helps conserve whatever your rolling with! I keep all my herb jars and smoking/rolling supplies on here.